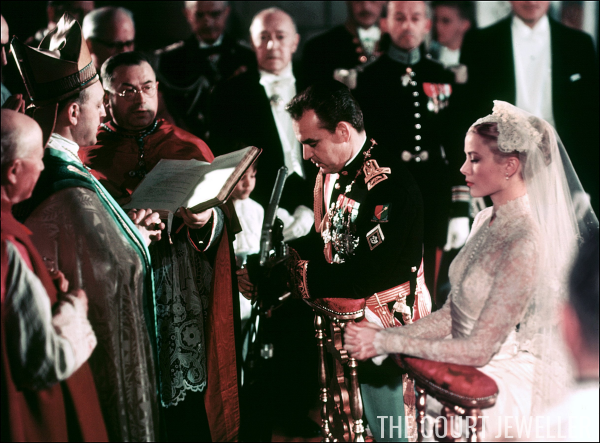 Sixty years ago today, Prince Rainier III of Monaco married Hollywood actress Grace Kelly in a grand ceremony at Monaco's cathedral. The bride's wedding ensemble was made by MGM designer Helen Rose and paid for by the studio. Instead of a tiara, Grace walked down the aisle wearing a juliet cap embroidered with seed pearls and a similarly-embellished Catholic prayer book. Thanks to the magic of the internet, we can relive the ceremony today. Enjoy!